Watch what happens when a second male agitates an adult panther chameleon. The green color scheme transforms to yellow and red in this X8 sped-up video. Chameleons, a type of lizard, are so good at changing color that "chameleon-like" is shorthand for a change in appearance that is fast, fundamental and often devious. Now, finally, we get an explanation for how one species of chameleon changes from vivid green -- a great camouflage for tree dwellers -- to yellow or orange with stripes of bright red and white. And then, when the threat of another male or the lure of a nearby female abates, the animal returns to the camo condition. "When it hangs in trees, it's green with reddish bars, it's very cryptic, very difficult to spot," says Milinkovitch, a professor in the Laboratory of Artificial and Natural Evolution at the University of Geneva, Switzerland. That camouflage allows the chameleon to wait for doomed insects that stray in range of a tongue that can shag them in a lightning-fast 0.003 seconds. To intimidate another male or impress a female, the panther shifts to its display color scheme. "It's a two-state system," says Milinkovitch. "It's cryptic or as visible as possible." Left: The resting color scheme of the male panther chameleon. Right: the aroused color scheme, used to attract females or deter male competitors. 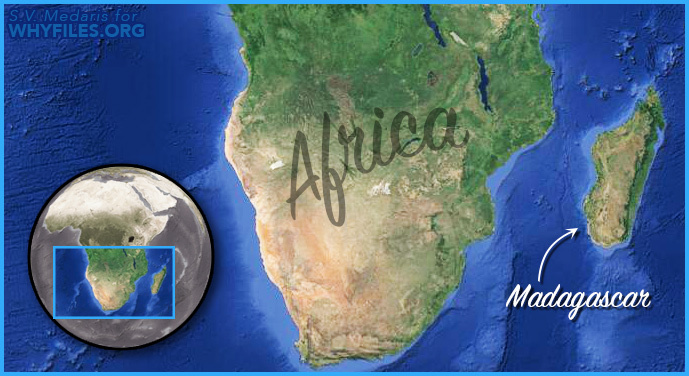 Panther chameleons evolved on the isolated island of Madagascar, where they shift color based on circumstances. 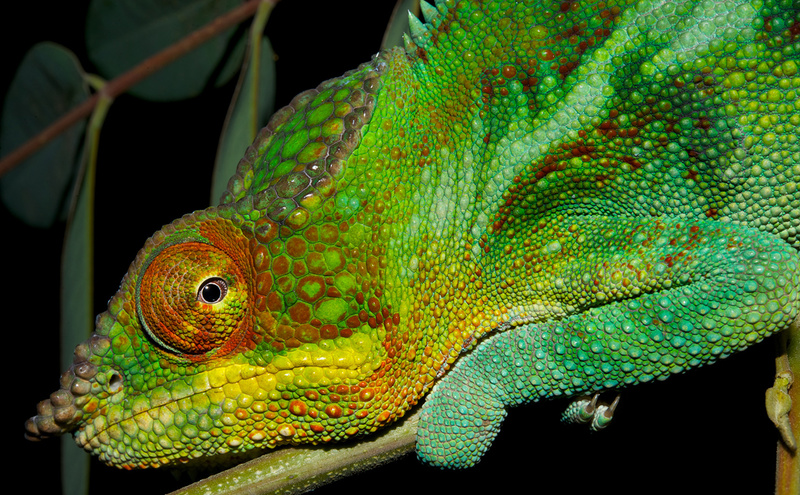 The panther chameleon manipulates light with two layers of what we'll call "color cells" in its skin. These cells, called iridophores, contain crystals of guanine (which is also a component of DNA). In the outer layer, a regular array of guanine crystals is separated by fluid. When the researchers made the cells swell or shrink, it altered the crystal spacing, and a different color of light was reflected from the skin. How does this work? Each time a photon of light interacts with a stack of guanine crystals, it is either reflected back or refracted (bent). Depending on the gaps between the crystals and the light wavelength, photons can undergo constructive interference, where its energy is conserved in reflectance. Or it can face destructive interference, where its reflectance energy is depleted. Left: Staining shows three layers of skin. Upper Right: Upper layer of color cells (called iridophores), with guanine crystals shown in two orientations. From one view, they form squares; from another view, hexagons. With this crystal structure, a small change in crystal spacing changes the color of light reflected from the skin. 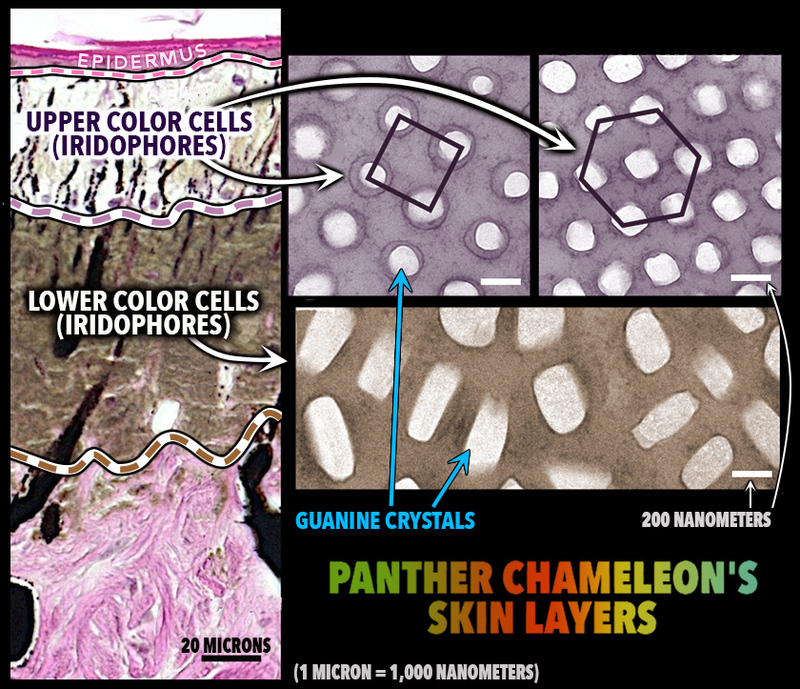 Bottom: Lower layer color cells contains larger, less organized guanine crystals that reflect near-infrared light. After just 10 layers of constructive interference, 100 percent of that particular wavelength will be reflected, says Milinkovitch. "These will be reflected with incredible efficiency; it's a selective mirror." And so by controlling the spacing of its crystals, the chameleon can control its color. Although the researchers used osmotic pressure to experimentally change the size and shape of the cell, in nature the alteration could be caused by the cytoskeleton -- the filaments that hold a cell in shape. "For cells in vertebrates with guanine crystals, this is the first demonstration of the phenomenon," says Milinkovitch. Depressions in the cell membrane in squid and the octopus have a similar effect. A male panther chameleon (Furcifer pardalis) photographed in Madagascar. A second discovery concerned the lower layer of color cells, where the guanine crystals are bigger, elongated and disorganized. In tests, the layer reflected as much as 45 percent of incoming near-infrared light. There was no sign of a change in the color of reflected visible light, and it's unclear if the chameleons can alter the amount of light reflectance. While other lizards display a layer of variably-organized guanine crystals, this was the first species to show two superimposed layers with different morphologies and different functions, said Milinkovitch. Chameleons have been a distinct group for about 90 million years, and they have evolved unique feet with fused toes, and eyes that move independently. Since the deeper layer has been found in three additional species of chameleon, "this suggests strongly that the ancestor of all chameleons had this innovation, which was either to protect against heat, or for color change, or both. I don't know if one came first." Once cells containing guanine crystals had gained the ability to affect incoming light, a mutation apparently conferred the second useful trait, he adds. "It's fascinating. These animals have invented layers that change color, allowing them to be cryptic or on display, and second layer that controls heating," Milinkovitch says. This kind of study is possible only because two labs across biology and physics are working hand in hand, with physicists and biologists working together on a daily basis."